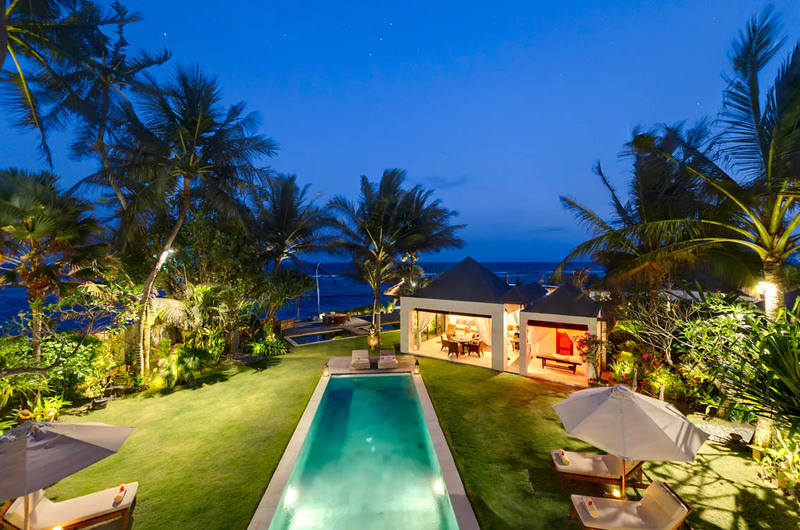 From $ 888AUD per night We have direct contracts with most villa owners. We don't add any booking fees. We are 100% transparent with no nasty surprises. 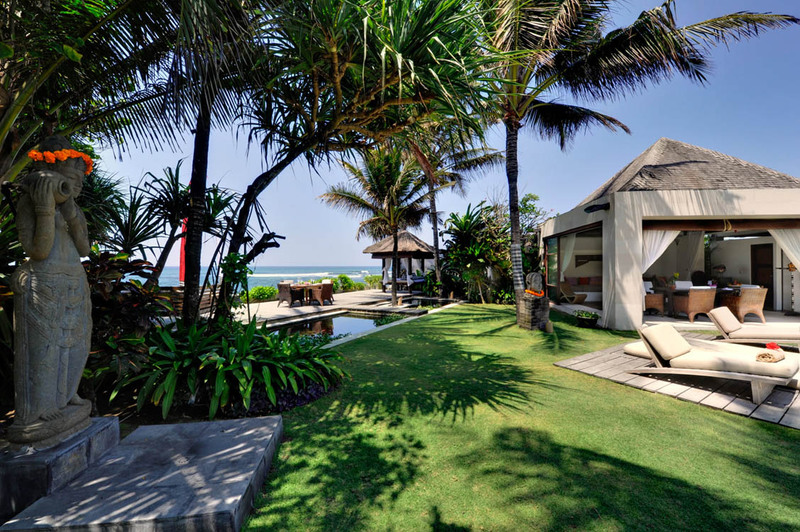 Absolute beach front Bali villa - rent this now! 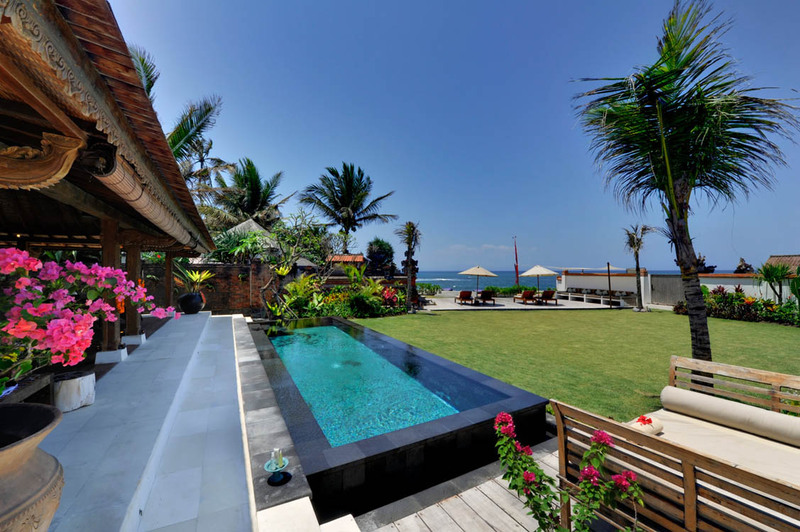 Large garden area for relaxing, sun baking & watching the ocean. 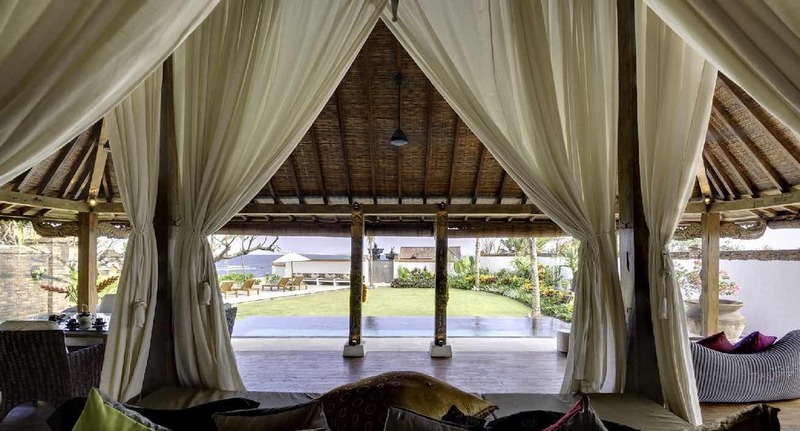 Villa Majapahit Maya is a stunning 4 bedroom Sanur beachfront villa holiday rental located in the lovely island haven of Sanur. 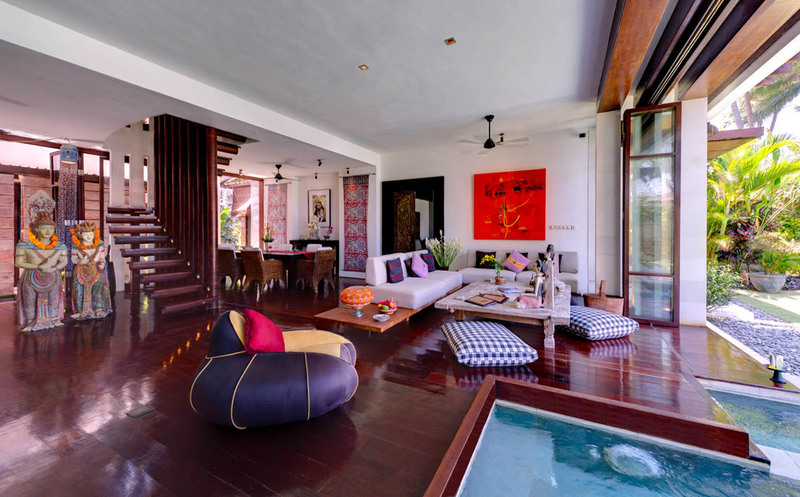 This villa is beautiful, tropical, traditionally styled and offers its guests all modern day facilities needed for them to have a fabulous beach side holiday in Bali. 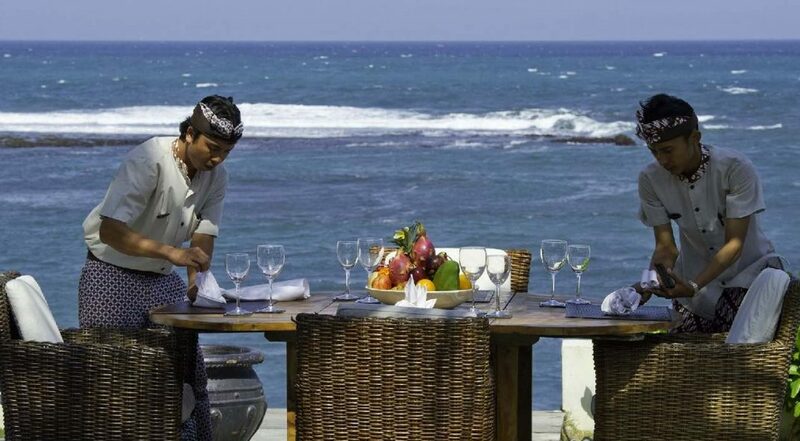 Located away from the tourists and noise of some hectic parts of Bali, guests will be lucky enough to have 5 star luxury service at this holiday villa: from your own private chef to personal butler. 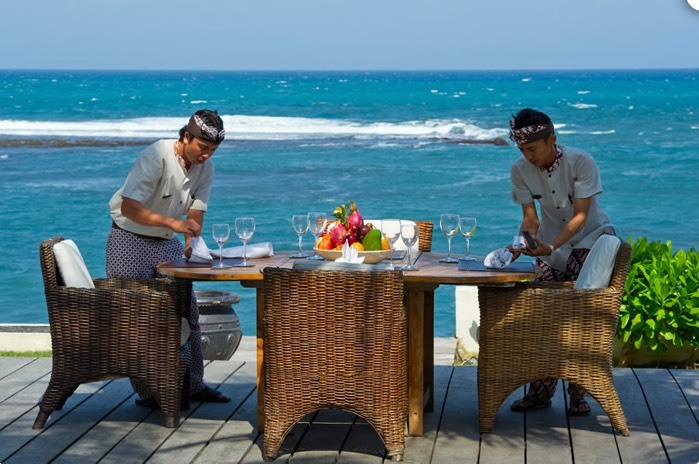 This fabulous experience is enhanced by the most stunning ocean views from most areas of the villa. 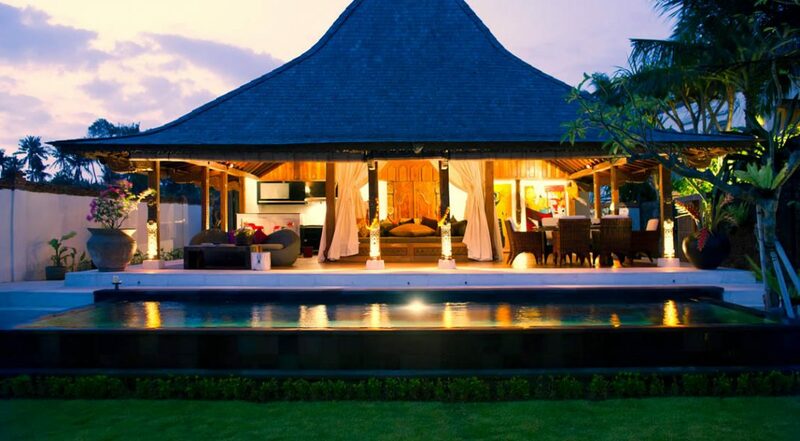 So what are you waiting for come to Villa Majapahit Maya and have the holiday of a lifetime! 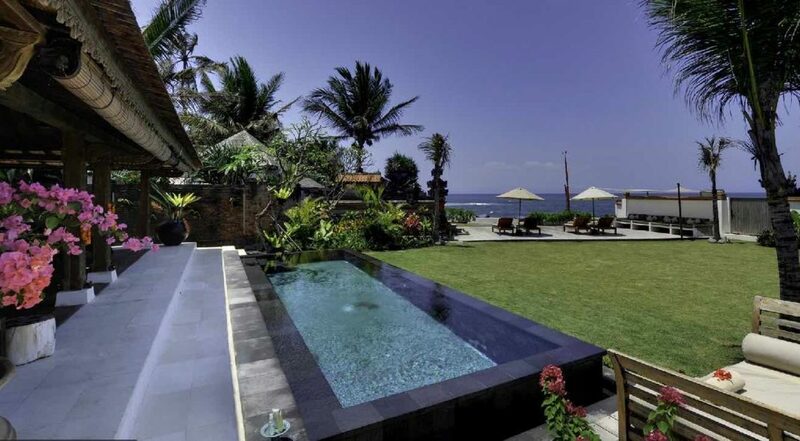 The outdoor and pool area of Villa Majapahit is simply fantastic. 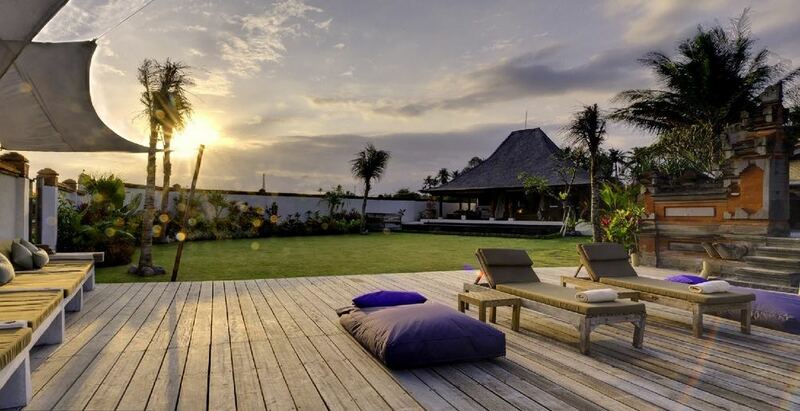 The villa has a traditional timber joglo house and a modern two storey white building. 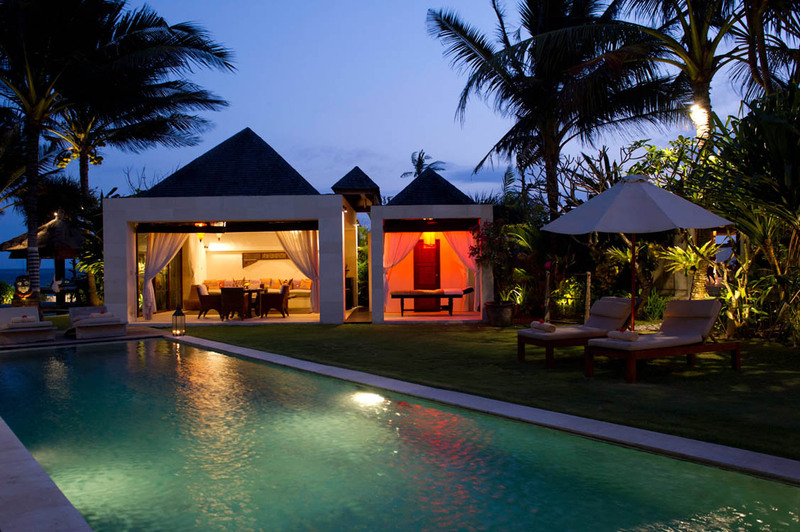 Each building is set in its own private garden complete with its own pool. 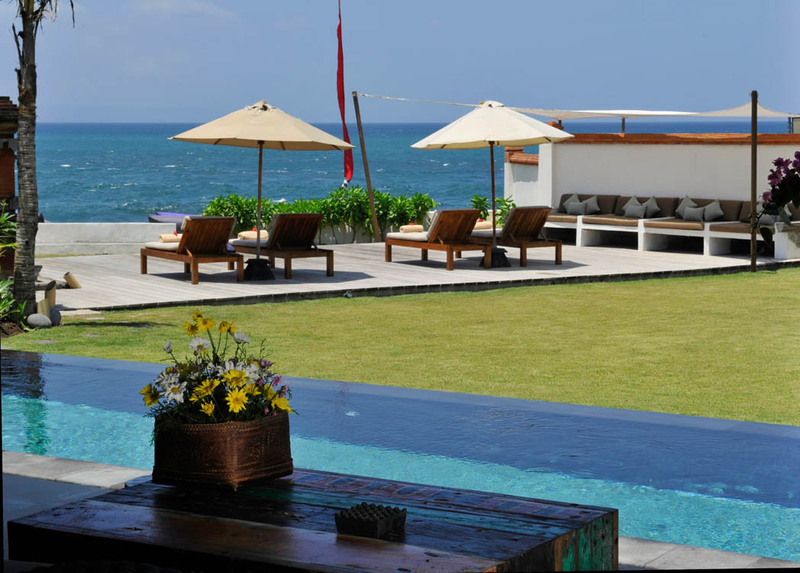 While the pool in front of the joglo has a wooden chair on one end, the other pool is surrounded by lounge chairs. Scattered around the villa are beautiful flowers, trees and plants which add to the tropical charm and allure of the villa. 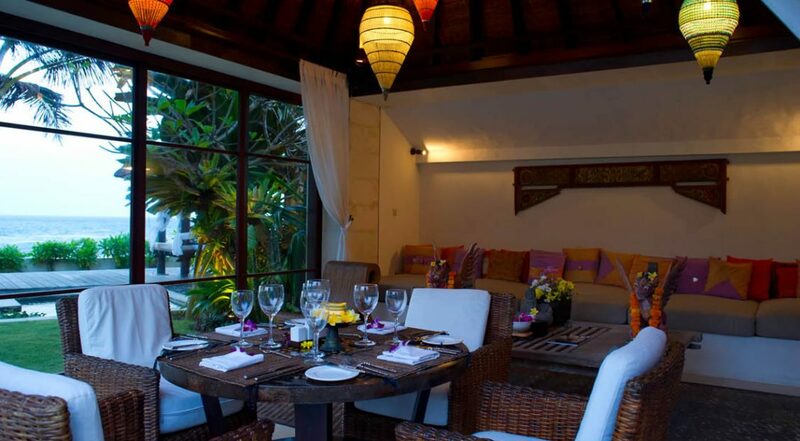 Each building of Villa Majapahit has its own living and dining area. 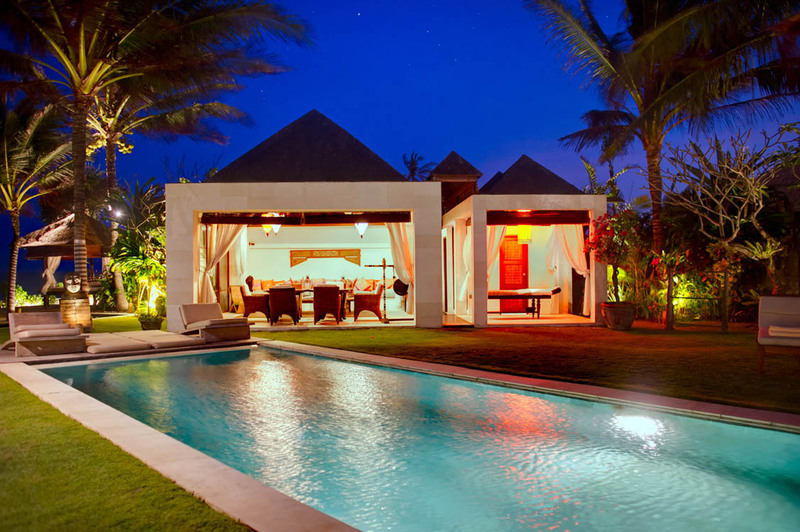 In the joglo, there is a small kitchenette, a grey sofa set and a rattan dining set, all facing the beautiful pool. 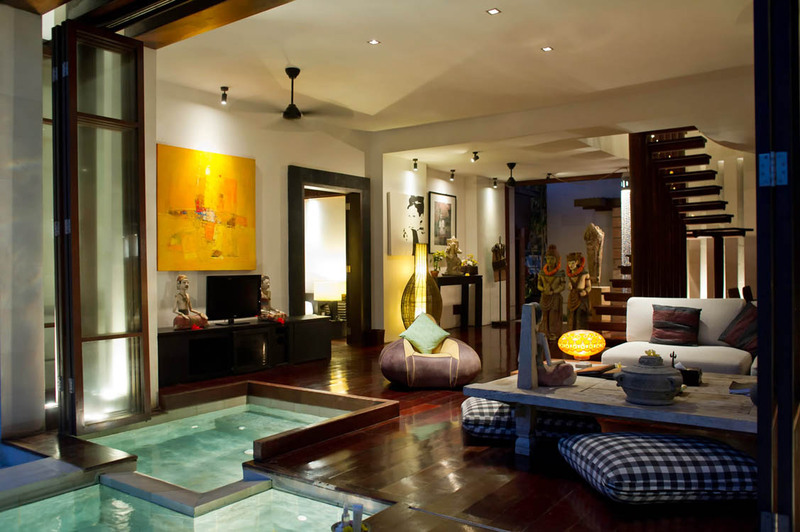 On the ground floor of the storey building, there is a lovely, Balinese styled living area. 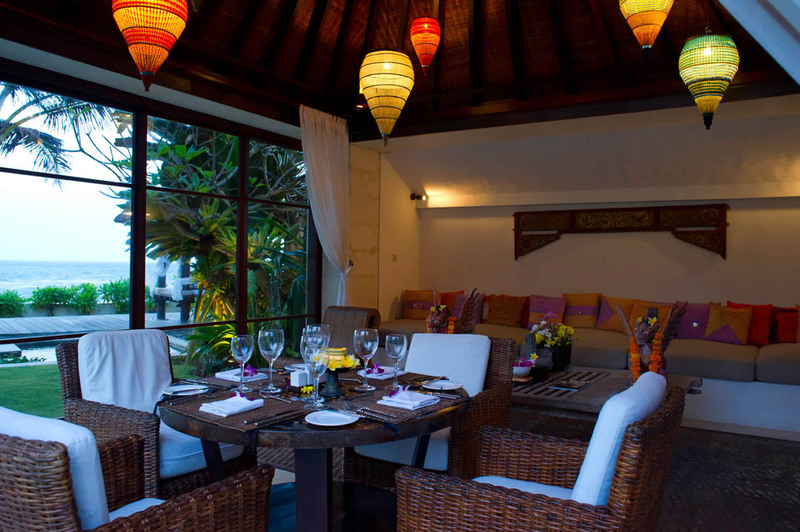 It is furnished with a comfortable sofa set, lovely Balinese statues, vibrant paintings on the wall and in the corner is a rattan dining set where guests can sit and enjoy eating together as a family. There are four beautiful bedrooms in the main building and one in the joglo. 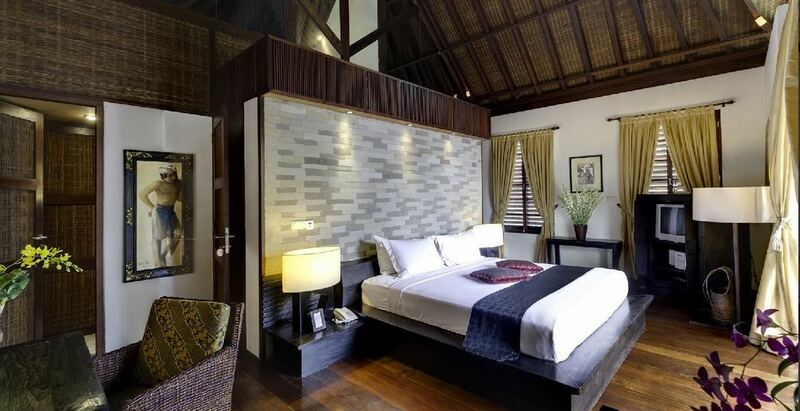 The master bedroom occupies the entire top floor of the building and it is quite splendid. It has a king size bed, stunning ocean views ( just imagine listening to the sound of the waves and those sunset drinks) and lovely décor. 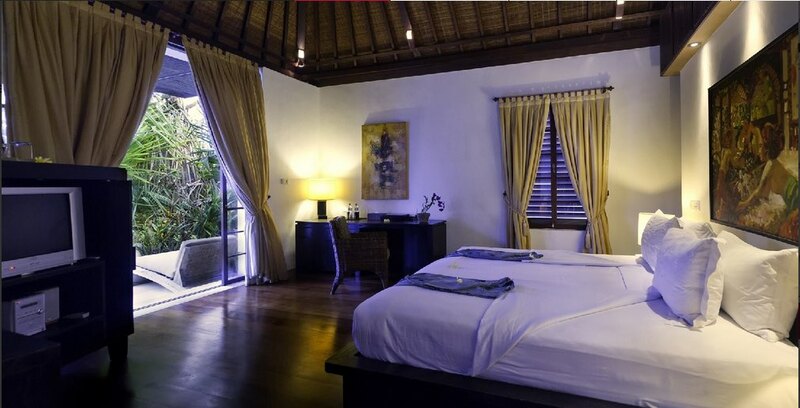 On the ground floor are the two guest bedrooms which are also quite comfortable and luxurious. 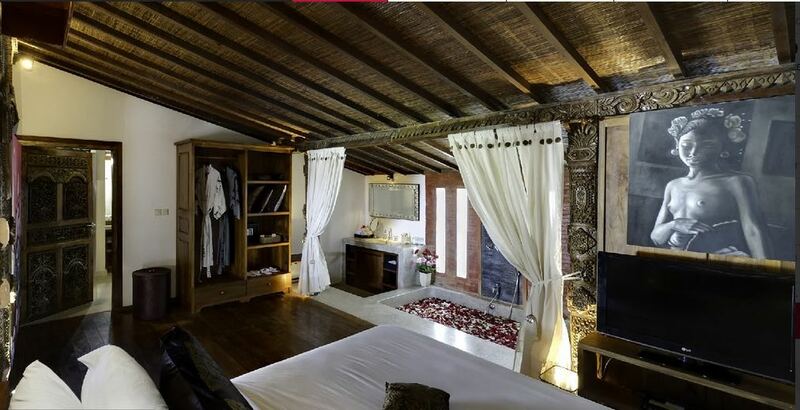 The bedroom in the joglo is spacious, traditionally styled and built for comfort. 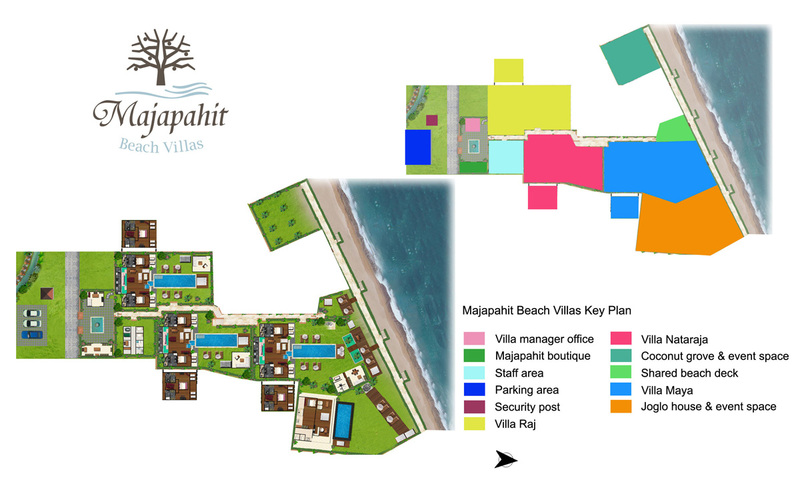 Villa Majapahit offers a variety of well trained staff who see to the smooth running of the villa. 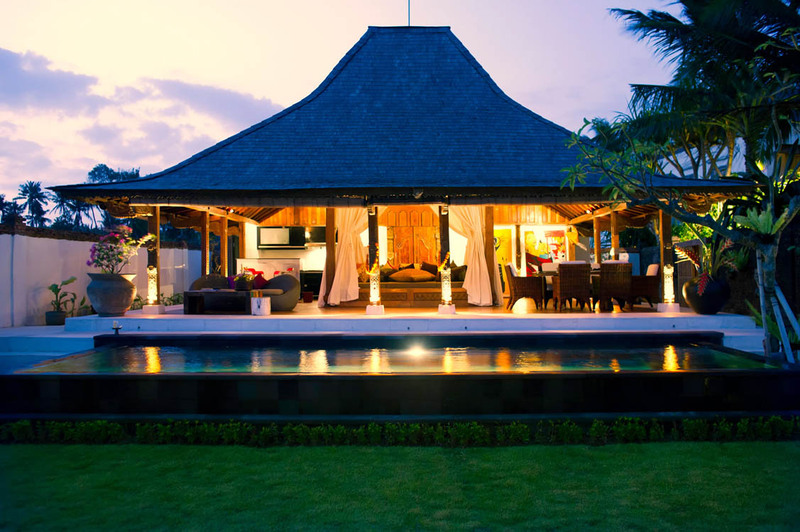 Guests will be living in total luxury with Villa Majapahit Maya’s courteous, giving, smiling and friendly staff. 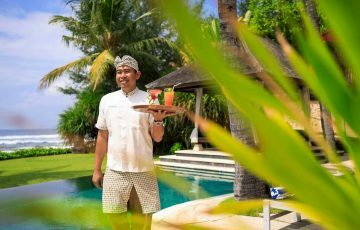 Staffed fully with six butlers, a chef, and garden/pool attendants, you’ll get to experience real Balinese hospitality and the best customer service here. 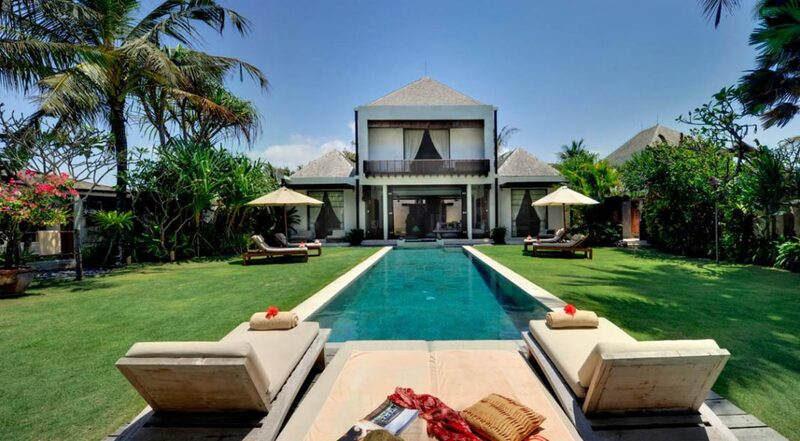 Located near the rustic village of Ketewal /Sanur, Villa Majapahit Maya is world’s away from the buzzing noise and tourists of Seminyak & Legian. 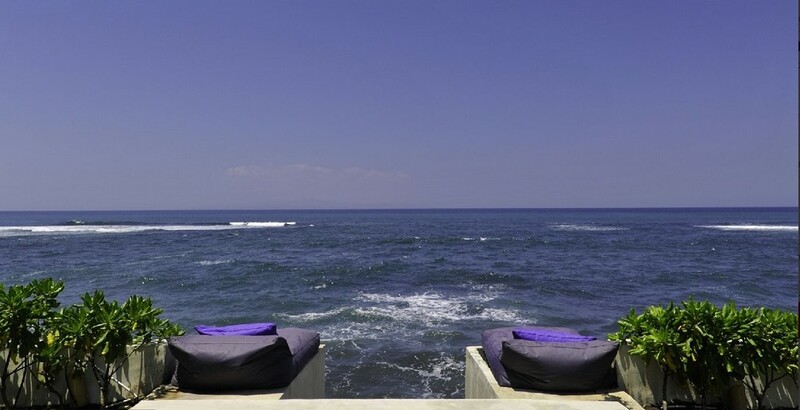 Guests can catch some waves and surf in Cucukan if they like. 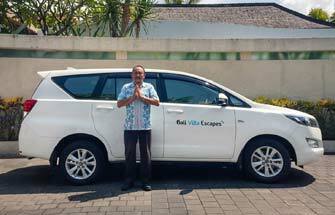 For those who would like to see some wildlife, Bali Bird Park/Safari is seven kilometers away. Another option for a fun afternoon is go for a horse ride at the stables, which is only three kilometers away. 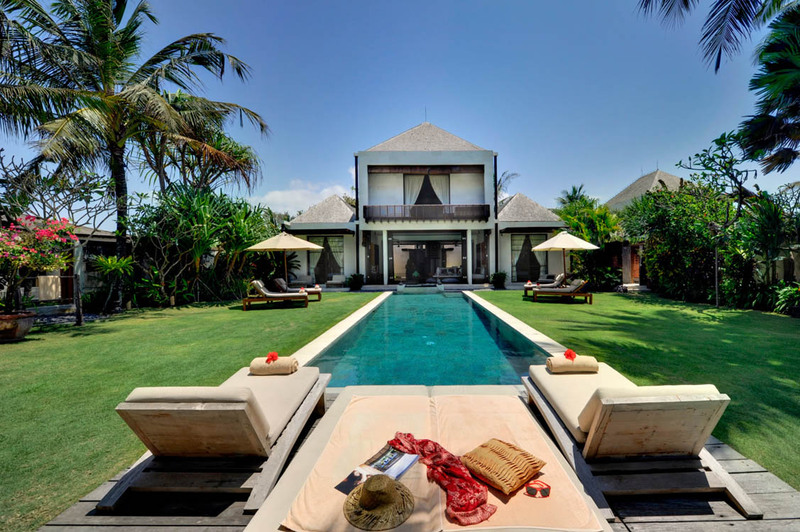 If you’re looking to explore the quieter side of Bali while seeing wildlife, catching some waves, and having a rejuvenating experience, staying at Villa Majapahit Maya is the place for you. 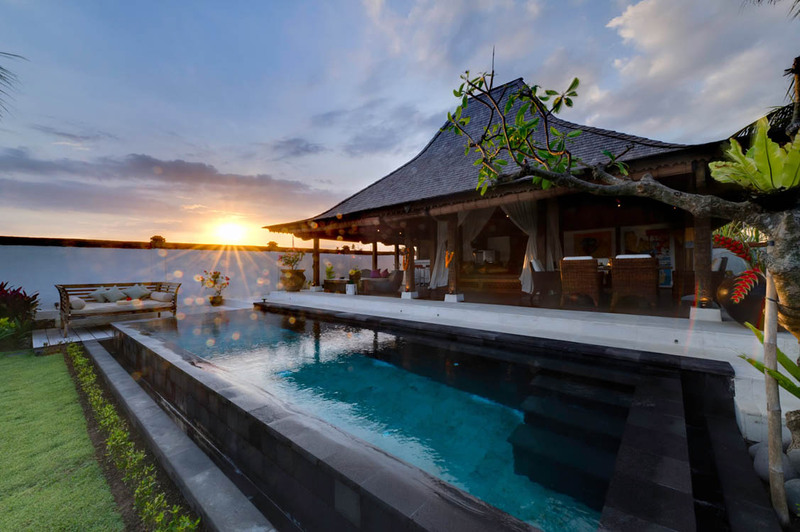 To view other beach front Sanur Villas or our full range of family friendly Bali villas please browse this website or contact our reservation team. 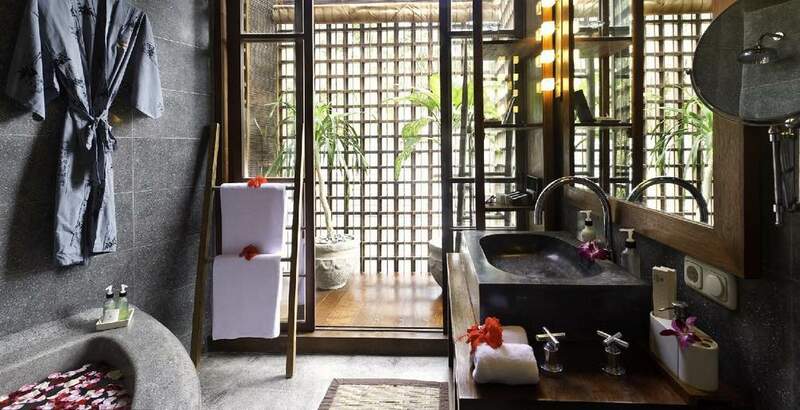 This is a popular Sanur holiday villa so if your planning a trip to Bali, especially during the Australian school or public holidays please book Villa Majapahit Maya well in advance. Occupies entire upper floor, under a soaring pitched roof, King-size bed, desk and chair, Satellite TV/DVD/CD player, Glass doors opening onto timber balcony with sofa and loungers, Panoramic sea views, Air conditioned, ensuite with bathtub, shower and two separate dressing rooms. We spent 8 days here with the family and loved every moment. The location was spectacular and we spent most of our time between the gorgeous pool and walking on the beach - this was incredibly relaxing and we all got some quality family time together which is exactly what we wanted. The villa staff were amazing and always there to make sure we were happy and enjoying ourselves - nothing was too much trouble. The meals they prepared were fabulous. 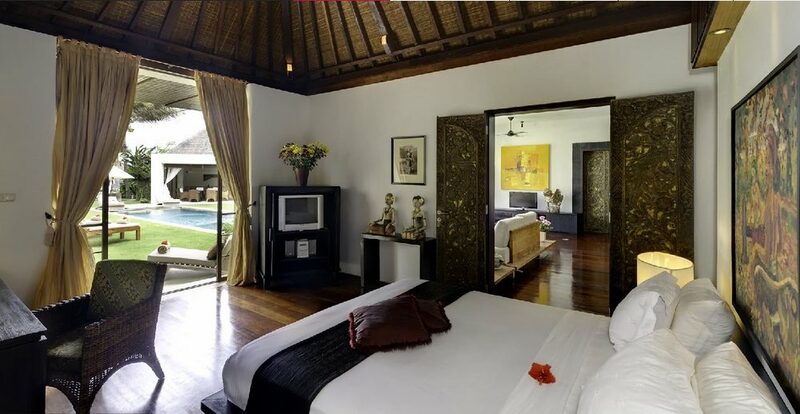 The villa itself was well maintained and the rooms were spacious and extremely modern. 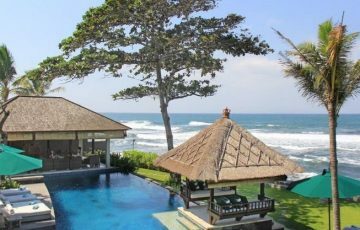 What else can we say except try it out if you want a fabulous family holiday in a perfect Balinese beach side setting - this easily gets a 10 out of 10. Perfect in every way. Peaceful and very laid back which was perfect and exactly what our family needed. 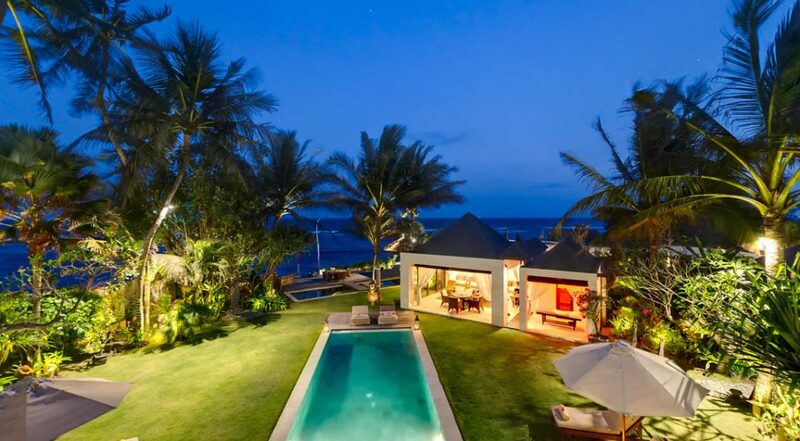 The oceanfront setting has to be seen to be believed. More importantly, the villa was exquisite. 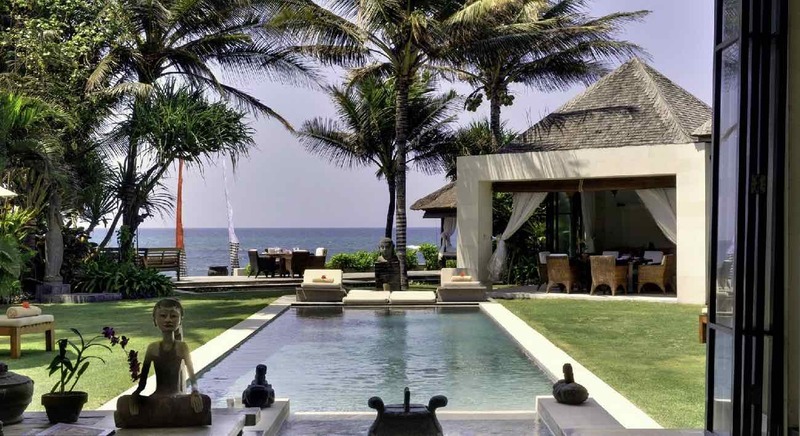 If the idea of being on the beach in one of the most gorgeous settings is your idea of the perfect holiday then you should really stay here at Villa Majapahit Maya. 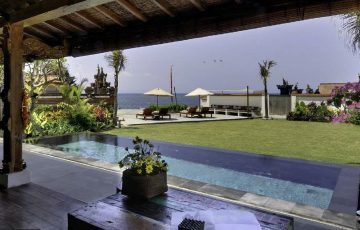 Thanks for such a wonderful trip and organising villa Majapahit Maya - we have already recommended Bali Villa Escapes to our friends who will be coming to Bali next year.